For details about dunning reminder configuration options, see Setting Up Dunning Process Management. 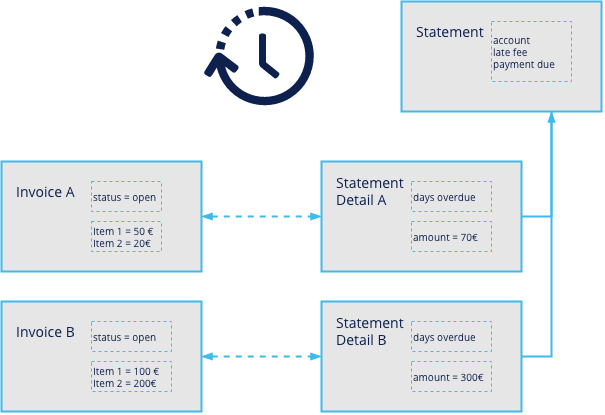 Using the Statement Runs functionality, you can create dunning reminders for multiple open invoices. Open the Dunning Run sub-tab. Select the dunning levels as required and, optionally, a dunning date. If you do not set a specific dunning date, JustOn uses the current date. This creates dunning reminders for all open invoices that match the conditions defined in the selected dunning levels. Note that JustOn generates one dunning reminder per dunning level for each account. If you have set up contact roles with address data for the accounts and corresponding contact role mappings for the use cases Dunning Contact or Invoice Contact, JustOn takes the address data defined with the contact roles. If there are no contact roles or matching contact role mappings, JustOn takes the address data found in the first included invoices. You can individually generate a dunning reminder for a single open invoice. Navigate to the invoice for which you want to create a dunning reminder. Select the dunning level as required. This creates a single dunning reminder of the selected level for the current open invoice. In draft dunning reminders, the text fields are empty. The values are retrieved from the corresponding template detail. Only texts that you explicitly specify in a dunning reminder text field overwrite the template text. Upon finalizing the dunning, JustOn pulls all values that are not overwritten from the template detail to complete the PDF. After creating draft dunning reminders, you check them for correctness. If necessary, you must edit the draft dunning reminders, modifying details like basic data, addresses, distribution instructions, texts, etc. Open the dunning reminders list. To access the dunning reminders list, click the statement run name in the Statement Runs tab, or open the Statements tab. Click Edit in the row of the dunning reminder you want to modify. Alternatively, you can click the dunning reminder name to open the dunning reminder and then click Edit in the detail view. without prior selection, all draft dunning reminders from the dunning reminders list at once. Click the dunning reminder name to open the detail view. Click Delete, then OK to confirm and complete the operation. This deletes the current draft dunning reminder. Select the checkboxes next to the dunning reminders you want to delete. Selecting the checkbox in the table header selects all dunning reminders listed on the current list view page. Click Delete Drafts, then click Continue to confirm and complete the operation. This deletes the selected draft dunning reminders. Click Delete Drafts without prior selection, then click Continue to confirm and complete the operation. This deletes all draft dunning reminders listed in the current statement run detail view or in the Statements tab. Once a statement run detail view is empty, that is, once you have deleted all draft dunning reminders produced in this dunning run, you can delete the statement run detail. Finalizing dunnings sets them to Closed, generates the PDF dunning reminders to be sent out, and adds the defined dunning fees to the account balance and the open invoice amount. As a whole, this makes the dunning operation legally effective. Once a dunning is set Closed, you can no longer change or delete it. multiple dunnings from the Statements list on the Statement Runs tab. Navigate to the Statements list in the statement run view or open the Statements tab. Click the statement name to open the statement's detail view. This sets current dunning reminder to the status Closed and generates the corresponding PDF document. Find the produced file on Salesforce's Files tab in the group Owned by me, if not configured otherwise (see File Distribution). Click the name of the statement run that has produced the dunnings you want to finalize. Select the checkboxes next to the dunning reminders you want to finalize. Proceeding without selection includes all dunning reminders. This sets all selected dunning reminders to the status Closed and generates the corresponding PDF documents. Find the produced files on Salesforce's Files tab in the group Owned by me, if not configured otherwise (see File Distribution). Sending a dunning reminder individually from its detail view. Select the checkboxes next to the dunning reminders you want to send, or leave all checkboxes unmarked to include all listed dunning reminders in the distribution. This queues the email distribution of the selected, or all, respectively, dunning reminders to the corresponding accounts. Optionally, deselect the checkbox Set the dunning to status Closed. Use this option to email a draft dunning reminder, which allows you to still edit it after it has been sent. This sends the current dunning reminder PDF and the related invoice PDF to the defined email recipient immediately. Select the checkboxes next to the dunning reminders you want to redistribute to a file distribution target, or leave all checkboxes unmarked to include all listed dunning reminders. Certain business use cases may require you to download dunning reminders. To this end, JustOn provides a custom button that allows you to select records from list views and download the corresponding PDF files to a ZIP file. Select the checkboxes next to the dunning reminders you want to download, or leave all checkboxes unmarked to include all listed dunning reminders.